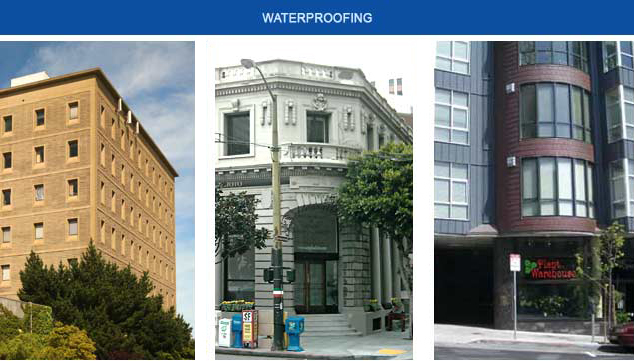 ARC is a leading waterproofing contractor serving San Francisco and Marin County. We waterproof concrete walls, floors and decks, both exterior and interior. For any new building, it is important to provide adequate waterproofing both above and below grade. We provide all necessary waterproofing services (including elastomeric and siliconized coating applications, crystalline and urethane rubber applications) at the start - on walls, above and below grade to avoid unnecessary remedial repair in the future. ARC also does leak analysis and installation of waterproofing systems to older, existing buildings. ARC repairs and prevents further water damage of stucco, concrete, and foam panel wall systems. Our skilled personel perform expert caulking of window and door joints. We install roof waterproofing systems; elastomeric liquid and single-ply membranes to create a flexible, durable protection system - and composite shingle roofs.